For the main openair website, see http://davidcarslaw.github.io/openair/. 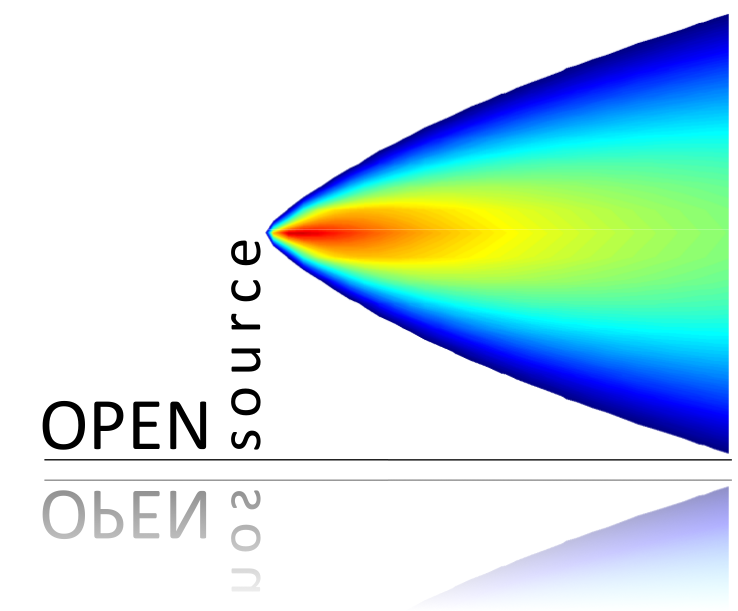 openair is an R package developed for the purpose of analysing air quality data — or more generally atmospheric composition data. The package is extensively used in academia, the public and private sectors. The project was initially funded by the UK Natural Environment Research Council (NERC), with additional funds from Defra. The most up to date information on openair can be found in the package itself and the manual which provides an introduction to R with a focus on air quality data as well as extensive reproducible examples. An archive of newsletters in also available at the same location. Installation of openair from GitHub is easy using the devtools package. Note, because openair contains C++ code a compiler is also needed. For Windows - for example, Rtools is needed. I also try to keep up to date versions of the package here if you can’t build the package yourself. openair has developed over several years to help analyse atmospheric composition data; initially focused on air quality data. Access to data from several hundred UK air pollution monitoring sites through the importAURN and importKCL functions. Utility functions such as timeAverage and selectByDate to make it easier to manipulate atmospheric composition data. Flexible wind and pollution roses through windRose and pollutionRose. Flexible plot conditioning to easily plot data by hour or the day, day of the week, season etc. through the openair type option available in most functions. More sophisticated bivariate polar plots and conditional probability functions to help characterise different sources of pollution. A paper on the latter is available here. Access to NOAA Hysplit pre-calculated annual 96-hour back trajectories and many plotting and analysis functions e.g. trajectory frequencies, Potential Source Contribution Function and trajectory clustering. Many functions for air quality model evaluation using the flexible methods described above e.g. the type option to easily evaluate models by season, hour of the day etc. These include key model statistics, Taylor Diagram, Conditional Quantile plots. It is easy to import hourly data from 100s of sites and to import several sites at one time and several years of data. 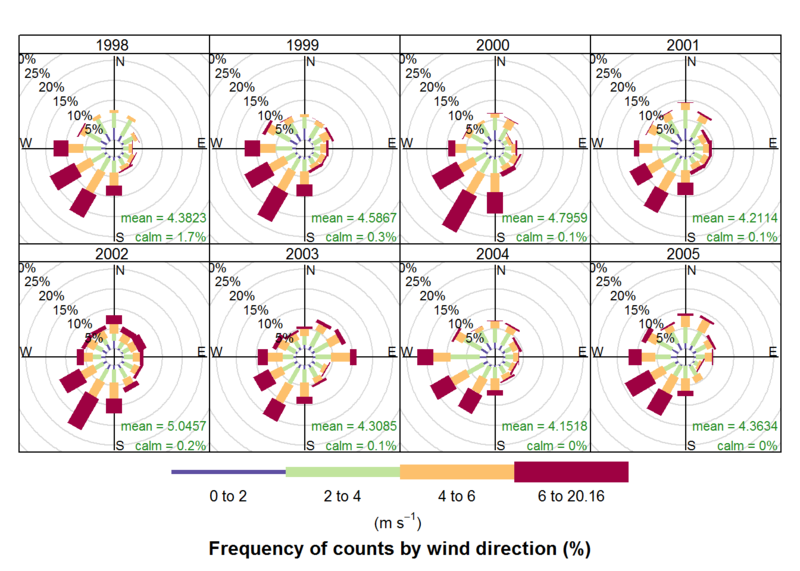 “wd” if wind direction (wd) is available type = "wd" will split the data up into 8 sectors: N, NE, E, SE, S, SW, W, NW. “seasonyear (or”yearseason") will split the data into year-season intervals, keeping the months of a season together. For example, December 2010 is considered as part of winter 2011 (with January and February 2011). This makes it easier to consider contiguous seasons. In contrast, type = "season" will just split the data into four seasons regardless of the year. If a categorical variable is present in a data frame e.g. site then that variables can be used directly e.g. type = "site". type can also be a numeric variable. In this case the numeric variable is split up into 4 quantiles i.e. four partitions containing equal numbers of points. Note the user can supply the option n.levels to indicate how many quantiles to use. 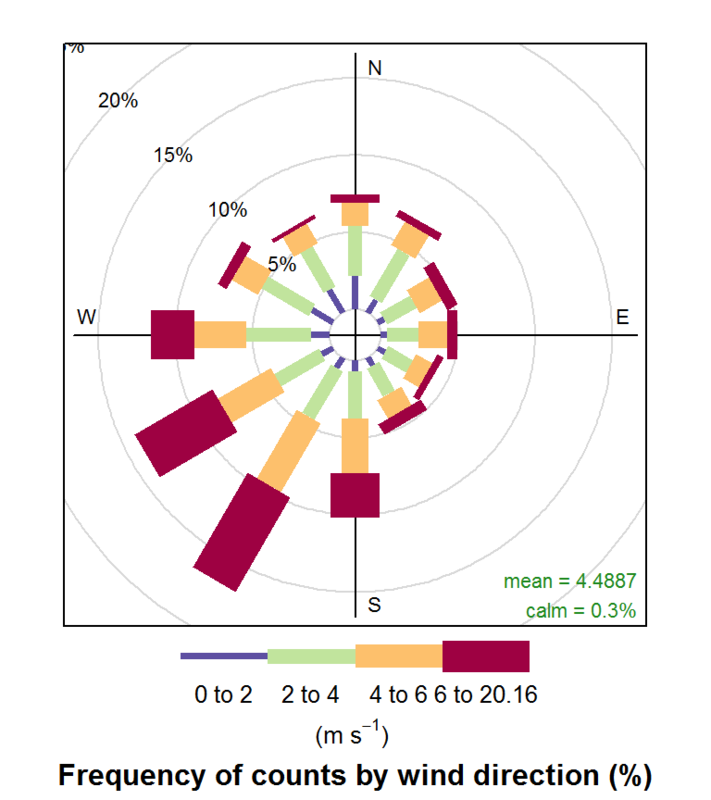 openair can plot basic wind roses very easily provided the variables ws (wind speed) and wd (wind direction) are available. However, the real flexibility comes from being able to use the type option. Developed by David Carslaw, Karl Ropkins.